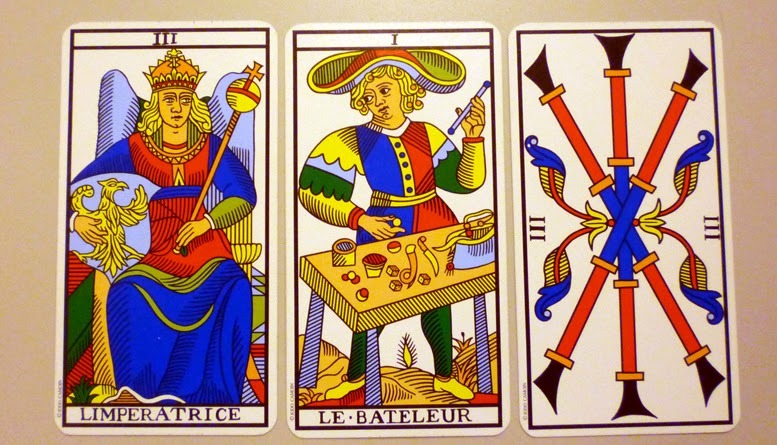 There are 456,456 possible three card spreads in a standard 78 card tarot deck. I love the symmetry of this number. As the spreads get bigger so does the number of possible combinations. But really as the spread is interpreted in all its subtleties the number is really nearly infinite. Each situation and question lends its own flavor to the reading. After this the symmetry breaks down. There is something significant here. A couple of days ago I worked my first successful evocation. I took to heart the imprecation that an armchair magician is one who always finds problems or reasons not to do a working and so never actually does one. It was a Thursday and more or less on a whim I looked up the planetary hours and saw that in 20 minutes it would be the hour of Jupiter. I decided then and there to do an evocation of a spirit of Jupiter. Astrologically it was less than ideal as Jupiter is retrograde right now and was within orb of an opposing aspect with the Moon. But he is in his exaltation (Cancer) and the Moon was moving out of the opposing aspect. I figured I would try it anyway. I didn't do any ritual washing nor did I change into any ritual clothing. I told myself that to meet with a spirit of Jupiter I had better wear a tie so I kept on the shirt and tie that I had worn to work that day. Looking in Agrippa's Three Books I chose Johphiel, the intelligence of Jupiter as my spirit. On a piece of paper I drew the kamea of Jupiter and then on the other side I drew the sigil of Johphiel, attached it to a string and wore it as a lamen with the sigil facing outward. Then on a larger piece of paper I drew the seal of Jupiter while repeating "from the office of Jupiter". I put the seal on my altar table with an obsidian orb on top of it, the incense burner behind that, and 4 blue candles on either side and slightly behind those. As I put each candle in its holder I intoned "Johphiel". I lit the charcoal for the incense so it would be hot and ready in time. Then I went through and turned out all the lights in my apartment. Before I went back into the room where the rite was to happen I paused for a moment in silence, cleared my thoughts, and then very deliberately entered the room. As I lit each of the blue candles I again intoned "Johphiel" then sat at my altar. I threw some grains of frankincense on the coals and meditated a bit to further clear my head and get into the mood of the working. I did the Bornless Ritual but haltingly and with the book on my lap for parts of it. (I really need to get that memorized better.) Then I recited the evocation from Miller's Sorcerer's Secrets again with the book open in my lap. I put the book down and then improvised my own based on that. After doing this for a while I heard a tapping noise on the other side of the room and gradually began to feel a presence. Although I was attempting to call Johphiel into a visible form in my stone, I felt that he was in the room, tall, near the ceiling. There were no other sounds, no voices, no figures in the stone or visible in the room. I went to throw more incense on the coals and dropped a grain on the seal of Jupiter. As I went to pick it up I felt the urge to stop, leave it and in fact put more on the seal around the stone, which I did. I made my petition to Johphiel and meditated a bit more trying to be receptive to any kind of communication but didn't notice anything significant. Then I gave the license to depart and meditated a bit more. After several minutes I suddenly felt the absence of the presence I had felt. It was almost like a source of heat or light was suddenly eclipsed or a constant sound suddenly stopped. I found it a bit startling and knew that the working was over. I snuffed the candles and put the nubs on the seal which I folded up and tied shut with the lamen and twine I had been wearing. The next morning I threw them into the river to dispose of them. Although I didn't get a full physical manifestation I still consider this a success. That night I didn't get any significant dreams that I remember and I'll keep my eyes open for blessings from Johphiel and Jupiter. It will be fun to explore this further. For the past several months my meditation practice has really suffered. If I did it at all I would often fall asleep, drift away, or become unaccountably frustrated, and often all three. Then the other day I read a post on the Unlikely Mage blog about some of the things that hinder meditation, specifically 'sensual desire'. The light went on for me when I read this. Not only was I being distracted by drinking, TV, and the Internet, but also by my lusting after results. I did a few Tarot readings for myself last night that suggested some important things not the least of which was that by lusting after results I was putting undue pressure on myself. The results would be frustration and feelings of failure. This is exactly the opposite of what the results of meditation should be. This morning I meditated for the practice of meditating. I didn't attempt any visualizations. I didn't try any relaxation techniques involving glowing balls of light. I didn't try to control the images or impressions that flitted across my consciousness. I simply sat and breathed and felt the breath entering and exiting my nose for about half an hour. Afterward I felt great, and I still feel great several hours later. Every once in a while I need to be reminded that the practice itself is often more important than spectacular results. Tonight I did my first working with the spirits of the Mansions of the Moon. At 9:56pm the moon rose above the ascendant at 10 degrees, 50 minutes of Gemini which puts it in the sixth Mansion, Al Hana. As the moon is waning right now I decided I shouldn't make a talisman and should instead use this time to start to build a relationship with the spirit of this Mansion. I chose benzoin as my incense as it seemed the least spicy of the ones I had on hand. I lit charcoal and nine white candles. I put the incense burner on my table and behind it my glass crystal ball. And as the smoke rose from the incense I repeated "Spirit of the Moon, Nadeyrahe, in the house of Al Hana, appear before me in this crystal," several times. Then I reduced it to "spirit of the Moon, Nadeyrahe, in the house of Al Hana." Then simply "Nadeyrahe" which I pronounced nah-day-rah-hay and repeated in a voice not much louder than a whisper. All the while I'm staring into the crystal letting my eyes lose focus and trying to see an image in the glass. After a bit I changed my focus to the flames of one of the candles and then to the moving smoke itself, still repeating the name. Then I moved my gaze back to the stone. I moved the candles somewhat so that they were more in a circle around the crystal, four on my left and five on my right and none directly behind the ball so that I couldn't see the candleholder in the crystal ball. Then I said "Nadeyrahe, come into my presence, bless me with your knowledge, bless my house, and bless those that I love," several times and then went back to repeating the name only, "Nadeyrahe, Nadeyrahe". It was then that I began to see the features of a face in the middle of the circle of flames reflected on the surface of the sphere. It was faint and rather mask-like without detailed features or expression. I said "Nadeyrahe, tell me what to do that we may be friends," but there was no change, nor did I perceive any communication or impressions. I continued to repeat the name until the smoke of the incense ran out. Then I said "Nadeyrahe, go in peace that we may be friends and that I may call on you when your house comes around again." I looked away from the crystal and used my snuffer to put out the candles starting on my left and ending on my right. Then I sort of sat in the dark for a few moments. All told the working lasted for about 45 minutes. For a first time I consider it a success even though I did not receive any direct communication. I feel that I was successful in calling forth the presence of the spirit. Perhaps next time it will be a bit stronger. Each morning I pull from my Tarot deck a card or a spread for the day. Lately I've been pulling a spread and here is today's. Right away the thing that jumps out at me is the symmetry of the two threes. These are very energetic cards bursting with creativity. The Empress is the creative force that not only expands the empire into new lands and territories but also has the power to bring those territories into being. She indicates enthusiasm. The Magician here is her architect ready with all his tools to put her plan into motion. He gazes at her, receiving her license to build the new thing. She gives him the energy and resources he needs to get started. The 3 of Wands indicates the bursting forth of passion, either sexually or creatively. The new project can't not happen. The enthusiasm of the Empress and the energy of the 3 of Wands combined with the skill of the the magician is like a tidal wave pushing its way to shore. It is a force that will run its course and very little can weaken it or stop it. And so I started this blog again. This is the fourth time I've started a blog. It is the third blog about my dealings in magic and the occult. My other blog, The Floating Image, is about my artwork. Often these two interests will overlap. In reality this blog will be a way for me to keep notes as I progress. There are two reason it has taken three attempts to get it going. First is that my ideas and points of view change as I progress and lean stuff. In retrospect that is probably the very reason why I should have kept it up. The second reason I abandoned the past incarnations of this blog is that I felt like I sounded such an amateur. But again as the blog progressed that feeling, I hope, probably would have diminished. At any rate, now that I have exposed my insecurities at the outset we shall begin the experiments of The Moonlit Hermit. To begin I think it is fair to say that I don't really fall into any specific category of a traditional follower of the occult. I'm not Wiccan, Neopagan, or Thelemite. I've found that I really enjoy a lot of the elements of Hermeticism but I feel no connection to the Kabbalah or Hebrew mysticism. In a way I feel like I'm forging my own path. And while I don't like the label "eclectic" it is closer to what I am working with at the moment. Maybe what I'm looking for is a non Judeo-Christian Hermeticism. Or maybe it's what the Golden Dawn would have looked like if it were not based in Hebrew mysticism. One of the purposes of this blog will be to explore just what it is I'm trying to figure out and accomplish. Some of the elements that resonate strongly with me are the Tarot, traditional astrology (especially the magic in the Picatrix), alchemy in a symbolic sense, spirit evocation and communication, and meditation with its attendant disciplines of visualization and energy work. So far in my magical career I have been long on study and short on real practice. Another purpose of this blog will be a log of my practices and experiments. It is well past time for me to actually start building some magical muscles. Figuratively I've done a lot of reading about walking but have only really practiced standing up. Lastly I think it might be important for me to note that this blog is for me. And while I'm posting it here for all the world to read it is here to serve my own purposes. I don't care if you read it. I don't care if you agree with what I have to say. This is the first post of the Moonlit Hermit. It is a blog about my workings in magic, astrology, archetypes, and the unconscious mind.